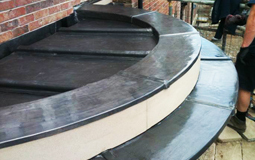 Lead-work is one of Roof Plus Ltd most eye-catching specialities, we specialise in new build, restoration and bespoke lead-works all completed to the highest standards. Lead is one of the oldest roofing materials as well as one of the most environmentally friendly as Lead is 100% recyclable. As well as these outstanding characteristics Lead will far outlast any other Roofing Material when completed correctly, we have just completed a Lead Flat roof which was first completed in 1696 over 300 years ago. We carry out lead-work to all kinds of buildings throughout the UK ranging from Chatsworth House, Liverpool central library, Florence institute, work for The National Trust as well as to many large new-build properties and have completed replacement Lead-works to several older properties. As well as working for the commercial sector we also offer a comprehensive small works service to private/domestic clients, within which we can design and install exclusively to the clients specification. 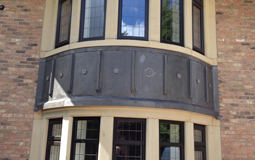 We specialise in every aspect of lead-work including Flat and pitched roofs, box gutters, sumps, valleys, capping and horizontal cladding details, all flashing details, turrets, pediments dormers and Lead Dome Roofs. Our lead-workers hold the highest qualification in British lead-working, the CSCS gold heritage skills lead-working card. 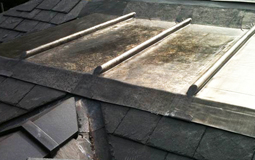 A Lead Roof may cost more than a felt, Single-Ply or asphalt roof but once it is laid there are no further maintenance costs, whereas if you add up all the maintenance costs needed to prolong the life of these products over the years, a lead roof can actually prove more cost effective. The look and style of a lead roof is without doubt the most impressive of all the roofing materials. Ask any roofer/builder which is the best method for waterproofing, style and durability and they will all probably recommend lead sheet. For anyone with concerns about the environment, rest assured because lead is 100% recyclable, so next time you see a lead flashing or box gutter it is very likely that the lead used is a lot older than the building it is fixed to. Please feel free to ask any questions you may have regarding the use of lead through the contact information provided.